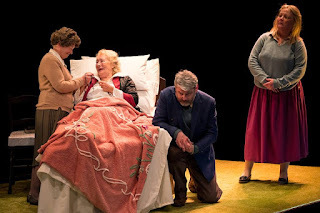 Lovers: Winners and Losers presents two loosely-coupled stories which together suggest playwright Brian Friel had a poor opinion of marriage and the role of the church and religion in ‘protecting’ it. In the first act a man and a woman sit on either side of the stage wearing natty jumpers and narrating the results of the investigation into two young people found drowned in a lake. On a hilltop high above them, we see the two lovers meeting up to revise for their school exams. Weeks later they are to be married, and seven months after that they plan to welcome a baby into the world. Outcasts from the Catholic town, they have each other. Mag is a scatty motormouth who has no filter and can emotionally turn on a sixpence. Ruby Campbell beautifully animates her character’s mood swings, set against the pregnancy and the script’s explanation of her family’s poor mental health. Her beau is Andy, a studious lad who is re-evaluating his ambition to escape the small rural town to study maths at a London college. (He’s the only person I’ve seen revising integration by mostly reading a textbook rather than doing sums on paper.) Thomas Finnegan plays the often quiet and withdrawn seventeen year old who, when he finally comes out of his shell, turns out to be a great mimic. Director Emma Jordan has given the young characters a hesitancy in reaching out and holding each other that underlines their juvenile nature. At first gently and then more forcibly, the couple’s different temperaments are shown to clash with each other. Home truths are blurted out. While the making up is great, their match is questioned. The use of the cramped study space is good, topped off with a fabulous downhill exit. It took a while for my heart to leave my mouth as Mag and Joe clambered around the hilltop, a perilous platform tilted towards the audience, rising above three trees on the shoreline of a glassy lake. 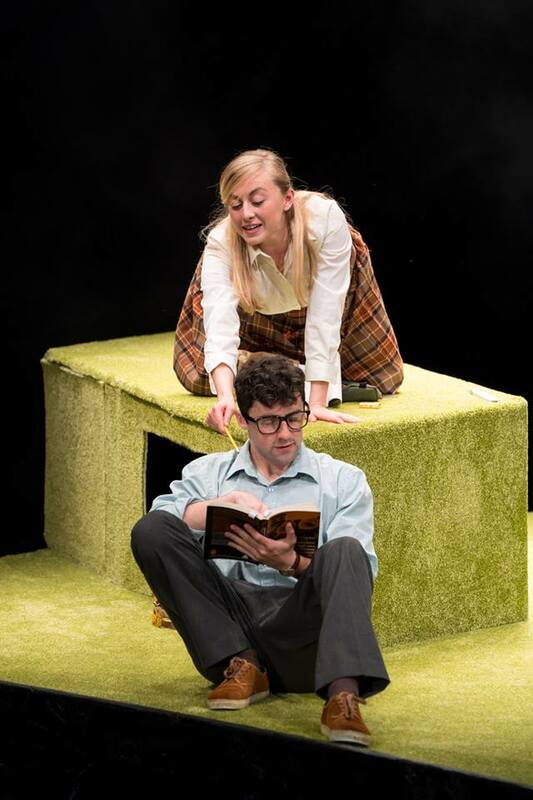 Whether an artistic decision or driven by the first act being nearly twice as long as the second, there is an undue haste to the matter-of-fact stage-side commentary (Abigail McGibbon and Charlie Bonner) which Friel expertly wraps the around the love story, sometimes getting ahead, sometimes running behind. Similarly Jordan intertwines lots of humour with the heavier unfolding tragedy to prevent a dark cloud permanently settling over the audience. During the interval, Ciaran Bagnall’s death-defying set was adapted to create an upstairs bedroom above a ground floor living room. Andy (Charlie Bonner) and Hanna (Abigail McGibbon) are an older couple. Randy flashbacks explain how Hanna’s bedbound mother (Helena Bereen) tried to keep them apart when they were curting downstairs. Now that they’re married, the angina sufferer is as determined as ever to continue to rule the household from her elevated eyrie, perfect for earwigging and ringing the hand bell she may have stolen from the Lyric’s duty manager. The entrance of pious spinster Cissy (Carol Moore) injects a lot of laughs into the significantly shorter second act. The aphorism ‘you’ve made your bed, now lie in it’ sums up Andy’s predicament. Using flashbacks, he reflects on his mistakes and missed opportunities that have trapped him in a marriage that is leaking its store of love and hope. McGibbon’s switch from potential escapee to internee is subtle, her disappointment with Andy’s unsanctified outburst heartfelt. The themes of escaping and enduring matrimony are at times both cynical, depressing and incredibly droll. Yet Friel’s script together with the rich characters and the precision of movement that Jordan’s direction mandates make breathes life into this 1967 play. Does religion continue to push people into poor decision-making? Does one generation curse the next with its views and behaviour? Lovers: Winners and Losers is playing the Lyric Theatre until 10 June. Engaged couples should perhaps be encouraged to attend: they’ll either come away determined not to be like Mag/Joe and Hanna/Andy, or they’ll decide that their future is apart! For the rest of us, it’s a very well constructed piece of theatre.